Choose a Design Color and Foil Color. 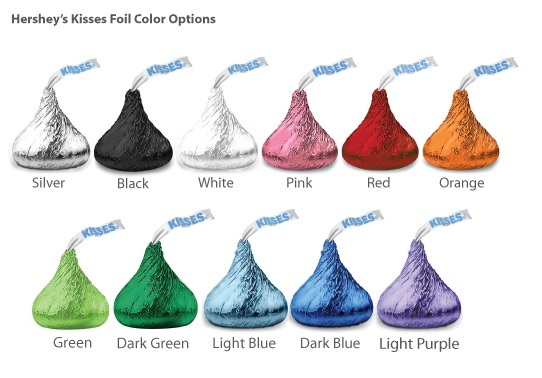 Hard to resist, Hershey Kisses are the quintessential little treat. These mouthwatering little drops of goodness have been putting a smile on people's faces since 1907, over one hundred years of sugary sweetness! Sprinkle these classic American treats on tables to add sparkle to your occasion or arrange kisses in favor bags. However you choose to spread these little favors around, make sure you have enough - after all one kiss is NEVER enough! Individually wrapped and arrives labeled with your personalized design. Item shipped in insulated cooler pack to keep chocolate safe in transit. We highly recommend choosing Express shipping to guarantee your chocolate arrives safely. Orders shipped via Ground will not be guaranteed.